The Melitta 46894 10-Cup Thermal Coffeemaker is a simple but well designed coffee maker that focuses on the most important part, the coffee. The brew is delicious and the thermal carafe is ideal for keeping your coffee warm, a great value for money coffee maker. The Melitta 46894 was designed for no nonsense coffee drinkers that do enjoy a quality cup of coffee in the morning. Save yourself that painstaking wait in line every morning because this coffee tastes just as good if not better. The Melitta 46894 is a fairly simple coffee maker that focuses on producing quality, good tasting coffee instead of focusing on gadgets and looks. One of the main advantages is that the Melitta 46894 is careful boil the water between 195-205 degrees Fahrenheit at which most of the flavor is released from the grind. It also uses a cone shaped filter basket which ensures that the water is in contact with the grind for a lot longer, the result is a richer and fuller tasting brew. To satisfy varying customer tastes, the Melitta 46894 features more than one setting at which it can brew coffee. The three different settings are regular, bold and robust. Depending on the type of grind you are using and the strength of coffee you are in the mood for just adjust the settings and enjoy. Although the Melitta 46894 focuses mainly on brewing coffee, it does have a few useful functions that make life easier. It features an auto off function which is programmable so you don’t ever need to worry about forgetting to turn it off. Another cool feature is the brew pause function which allows you to stop the brew cycle in the middle so that you can pour yourself a cup, perfect for those who can’t wait! 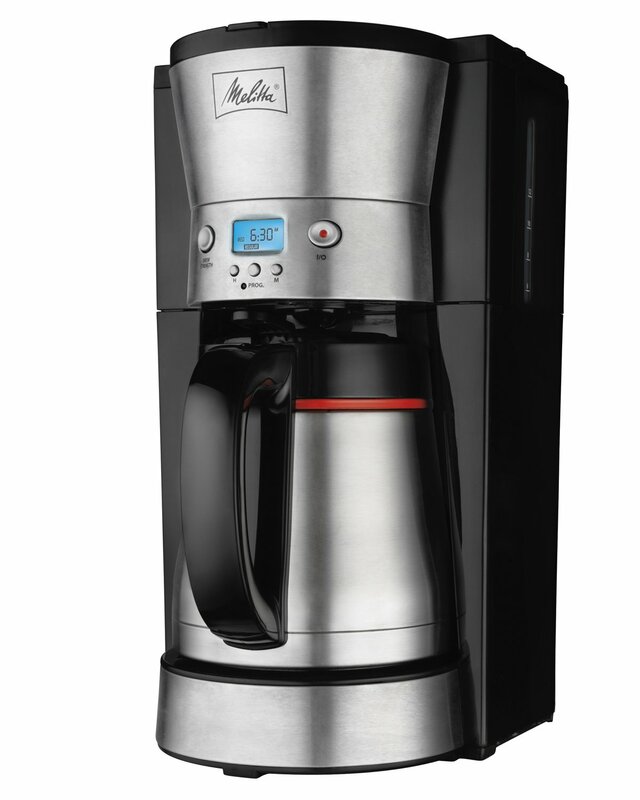 The overall design of the Melitta 46894 was thought about as well. The entire coffee maker does not take up too much space, the dimensions read 10”W – 9.25”D – 14.5”H, so it will ft on just about any cabinet or cupboard. Also you will find the water reservoir to be located in such a way that filling it up is not tricky at all. The thermal carafe is made of stainless steel and can hold 12 regular cups of coffee. One of the main advantages of this design is the thermal properties that slow down the cooling of the coffee. Coffee tastes best when it’s hot but leaving it on the hot plate for too long can ruin the taste so a thermal carafe is the perfect solution. Moreover, the spout of the carafe was designed in a drip free manor to make pouring a cup hassle free. All in all I can highly recommend the Melitta 46894 to anyone not looking to spend too much but still expecting a quality brew. It’s refreshing to see a coffee maker focus on the most important part, the actual coffee, and not all the bells and whistles around it.